58 Linda Vista Avenue | Hugh Cornish : Real Estate of Atherton, Menlo Park, Portola Valley, Woodside and Palo Alto. Peninsula homes of the Bay Area. Located on one of the most desirable streets in West Atherton, the beauty of this flat, rectangular parcel of approximately one acre is enhanced by mature perimeter trees. 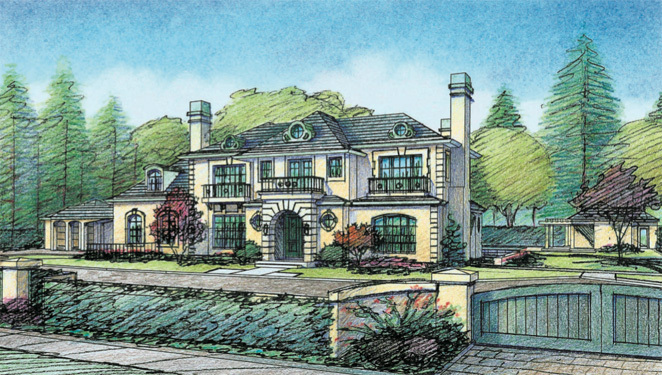 Plans for a magnificent, two-story, approximately 9,500-square foot residence, custom-designed by Pacific Peninsula Architecture, are included in the purchase price. Top-rated Menlo Park schools.